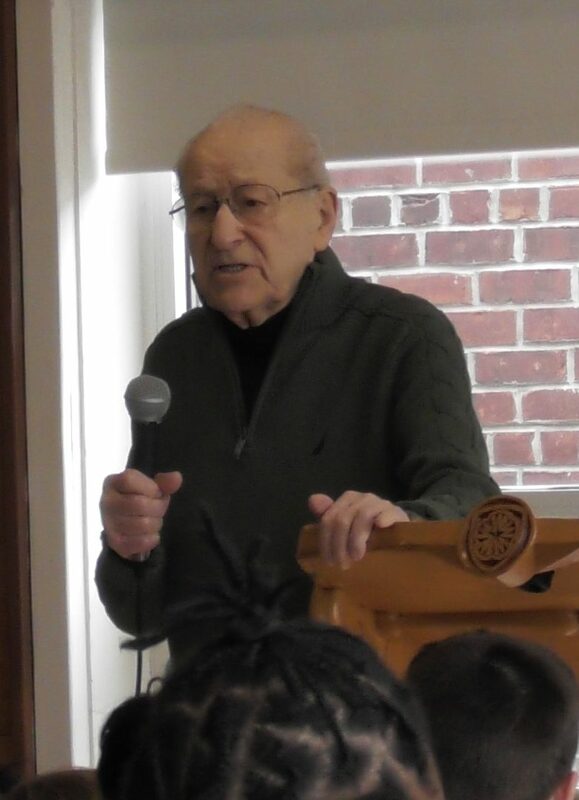 On Wednesday, January 16th, Irving Roth, the Director of the Holocaust Resource Center at the Temple Judea, and one of less than 100,000 remaining Holocaust survivors, visited our School to share his experiences with our students. The presentation, which took place in our High School Student Room, captivated the full room as Mr. Roth brought his extraordinary story of survival through a horrific period of history to life. Mr. Roth was born in pre-WWII Czechoslovakia, a time when the country was relatively stable with ample opportunities for people of all faiths, including Mr. Roth’s Orthodox Jewish family. He recounted how slowly and methodically life changed for the Jewish people after Hitler came to power in Germany and subsequently occupied the part of Czechoslovakia where the Roth’s lived. Jewish people were increasingly demonized in his “new” home, renamed Slovakia, and all over Europe as propaganda permeated their lives and turned even close friends into opportunists and enemies. He recounted how his family lost their lumber business due to the deception of friends and how neighbors looked the other way as atrocities against the Jewish people prevailed. After moving to Hungary to escape their dire circumstances, Mr. Roth and members of his family were taken from their home and sent to Auschwitz, where he and his brother, nicknamed Bondi, were separated from their grandparents. Mr. Roth recounted the days of endless physical labor with little food, unsanitary conditions, and abusive treatment that he endured at the concentration camp, including the tragic loss of his brother. As the war drew to a close, he faced multiple death marches as Nazi’s guards attempted to move the prisoners, before he was finally rescued by American troops. Upon returning to his hometown, he did not receive a hero’s welcome, in fact quite the opposite. 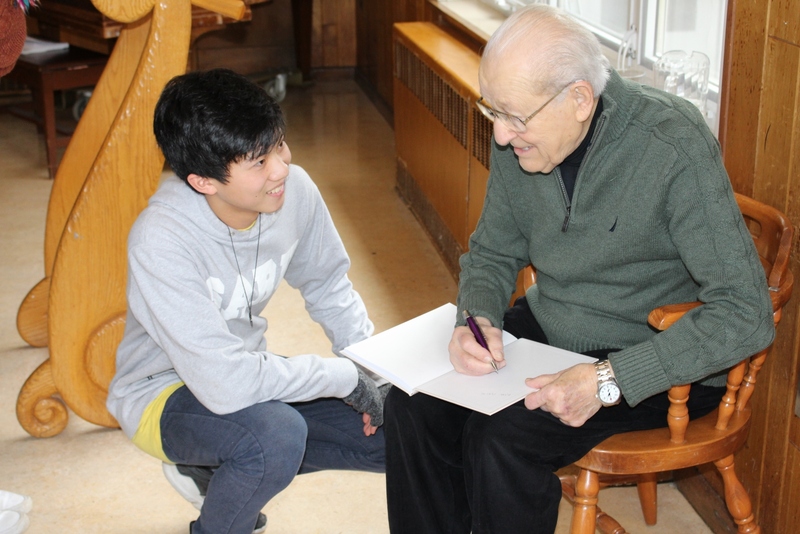 However, he was elated to have found his parents had also survived the harrowing ordeal with the help of a young nurse, whose husband happened to be a soldier in the German Army, who hid them in their apartment. 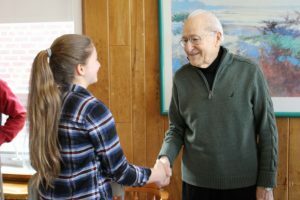 After telling his story, Mr. Roth implored the students in the audience to continue to tell the story of the holocaust to future generations and to never turn a blind eye to evil they see in the world. He asked them to do their best to see the signs of impending tragedy, and to not be a bystander but to take action to prevent it. The lecture particularly resonated with the senior class, who is currently reading Man’s Search for Meaning by Viktor Frankl in their English class. The book is a deep exploration of Frankl’s own Holocaust experience, and how he used said experiences to inform his own philosophies on life. The class is also watching Night and Fog, a 1956 documentary by French Director, Alain Resnais. The short documentary, made 10 years after the liberation of the concentration camps, focuses on the abandoned camps of Auschwitz and Majdanek and describes the lives of prisoners. According to the seniors, hearing Mr. Roth’s accounts firsthand, greatly increased their personal connections to the materials studied in class. After the event, students were able to purchase signed copies of Mr. Roth’s book, Bondi’s Brother. We are truly grateful to Mr. Roth for taking the time to speak to our students, and a special thank you to current parent, Rabbi Jodie Siff-Scherr for helping our students arrange this important event. To learn more about the Holocaust Resource Center at the Temple Judea, click here.